With the cooler weather and a bit of a busier week last week I’ve been so achy and tired and there’s nothing better for that than a bath. I thought I’d try the Lush Holey Night Bath Bomb from the Christmas collection as it’s new and I wanted something calm and relaxing this evening, plus I do love that name. This is one of those that doesn’t really have all that much scent when it’s dry so I was interested to see how it smelled when it hit the water. I haven’t really read reviews of the new products and I didn’t expect the colours that came out of the bath bomb. I normally have multiple baths from one bath bomb but I felt like a treat so used it whole and I’m kind of glad I did. This is one that could do two or three baths and if you sprinkle the dust around you could get some amazing patterns but it was nice to have that surprise of the colours swirling round. After the Lush haul post on Wednesday I couldn’t wait to try something Halloween, it is the perfect season for baths after all. So I gave the Eyeball Bath Bomb (£4.95) a go and I think I may have to stock up on a couple of these before they disappear even though I promised myself October was a no buy month. This is definitely suitably spooky looking for a Halloween product, especially when it’s floating around staring up at you in the tub, and I was interested to see how this one smelled when it hit the water. In my last post I sad it smelled like a combination of citrus, snow fairy and dream cream but I have a feeling that may have been because of what else was in the box with it as I didn’t get that at all in the water. I tend not to buy much Lush any more, ten years ago everything I had was by them, but I always get dragged back in at Halloween and Christmas. This year I’ve not gone over the top, for me anyway, but I do like to try new products that sound nice to me to know if I’m going to try and get them in the sale. I got three of the Halloween products and quiet a few of the new Christmas products so I thought I’d put them all in one post. This is pretty much a first impressions post, though I have used a couple of them before if they aren’t new this year I can’t say that they’re definitely the same as in past years even if they smell like it. It feels so early but a lot of stores are releasing their Christmas products. As I was planning on trying a few of the Body Shop’s new products I saw these two sets and wanted to give the new Christmas scents a try. This year they’re releasing a range of products in Berry Bon Bon (mixed berry sweets), Peppermint Candy Cane (sweet mint) and Vanilla Marshmallow (sweet vanilla, which didn’t appeal to me) and these sacks looked like they’d give a nice range of product types to try as well as meaning I now have some great travel sized products. I was quite good and resisted the advent calendars, for now anyway. I really want the £45 one but I would probably end up with too many advent calendars and no money if I got all the ones I want this year! Some of the other products I chose are ones I’ve either wanted to try for a while or have just found out about and couldn’t resist. I’ve sort of fallen in and out of love with the Body Shop products over the years as they can be a bit of a single note scent and them being owned by L’Oreal, but their ginger shampoo is amazing and I’m always drawn in by the Christmas scents so I wanted to try them early this year rather than leaving it to the sales and missing out because I don’t know what they smell like. The Sakura bath bomb is one of the older ones from Lush in the current range, I think they’ve been around for the past ten plus years I’ve been buying from them. It’s supposed to be a light blossom scent and has obvious salt crystals in it as you can see from the look of it on the outside. It’s a fair sized bath bomb, though I think it may be smaller than it used to be but that may be me remembering wrong. It costs £3.75 so standard for a Lush bath bomb, and it does actually work ok for two baths if you can separate it into two pieces. I have to say I do love the colour mix in this with the turquoise and pink along with the white, it’s one of the more subtle bath bombs in the range but an old favourite so I was happy when my sister got it for me for my birthday as I haven’t had one for ages. It reminded me that I should probably go back and revisit some of the longer running products I used to love rather than just sticking with trying all the new things when they come out. I feel like I bought the Lush Christmas products ages ago and I haven’t got round to trying half of them yet and they’re already going to be disappearing soon! If you’ve ever been into a Lush store around Christmas time you probably know about Snow Fairy. It’s a staple that comes back each year and, despite the name, doesn’t really have that much to do it’s Christmas scents to me. It seems to be one you either love or hate and it’s pretty much how I imagine the colour pink would smell if colours had a scent. There’s a range of different products in the Snow Fairy scent range and this year they’ve brought out one of their new products, the jelly bombs, in the range. 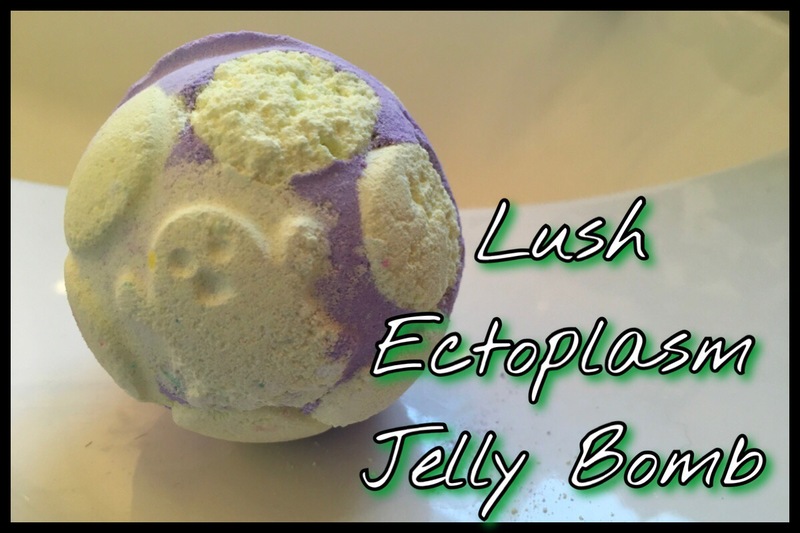 These are a new product this year and I’ve previously tried the Ectoplasm one from the Halloween range and I wasn’t sure how I felt about that one. Maybe it’s just me but there seems to be quite a difference between the two products to me and they’re supposed to be the same with a different scent. Has anyone else found that with the jelly bombs? They’re a fair sized bath product and, if you don’t mind missing out on the layers effect, they could easily do two baths. They cost £4.95 each but if you do manage to get two baths out of it it isn’t too bad price wise.